I can’t tell you how many batches of homemade jam I’ve made lately… Okay, well, yes I think I can. 4 batches in the last few days. Obsessed much? Yes. I love this stuff! And between making breakfast protein cookies and these guys – I just can’t quit. The jam is such a fresh, beautiful way to get a touch of sweet without the sugar additives. I found this recipe on my new favorite vegan blog – Oh She Glows! You’ll be hearing a lot of that lately. I adapted it a bit trying to eliminate the maple syrup and use dates instead. It’s definitely a bit more savory if you use the dates and almond milk but you can use a dash of maple syrup and just try to cut down on that sweetener a bit. If you want it sweeter – use the syrup and you can add one more date to the mix! If the batter isn’t sticky and thick enough then add a little more maple syrup or almond milk to help bind it together. Sometimes with the dates, you’ll end up with a consistency that is more oats and flour. Don’t be afraid to experiment and make it to your liking! For the jam – you can reference my jam recipe here. I’ve used a lot of different fruits this past week – strawberry/blueberry, peach/blackberry, raspberry/blueberry… I’ve found the key to eliminating the sugar is to use a tart berry like a raspberry or strawberry with whatever else you use. That tartness gives it a bolder flavor and you can use water to thin it out and make the jam instead of maple syrup! Calorie savers!! Go make these. Just do it. For the chia jam – follow the directions according to the link! For the oat squares: In a small mug, mix together the chia seeds and water. Set aside for about 5 minutes until thickened. In a large bowl, stir together the melted oil, maple syrup, brown rice syrup, and vanilla. When the chia egg has thickened, stir that in too. Process the dates till they reach a paste. And add the other wet ingredients to the mixer. Stir or process in the rolled oats, almond flour, oat flour, baking soda, and salt until the mixture comes together. It will be quite sticky, but this is normal. *If it’s not the right consistency and isn’t “sticky” then add in a bit of maple syrup or a touch of almond milk. Spoon 2/3 of the oat mixture into the prepared pan. Place a piece of parchment paper on top of the dough and press it down to spread it out evenly. Use a pastry roller to roll it out smooth into the corners. I repeat: the dough will be very sticky! When the chia jam has thickened and cooled, pour all of it on top of the oat mixture and spread it out evenly. 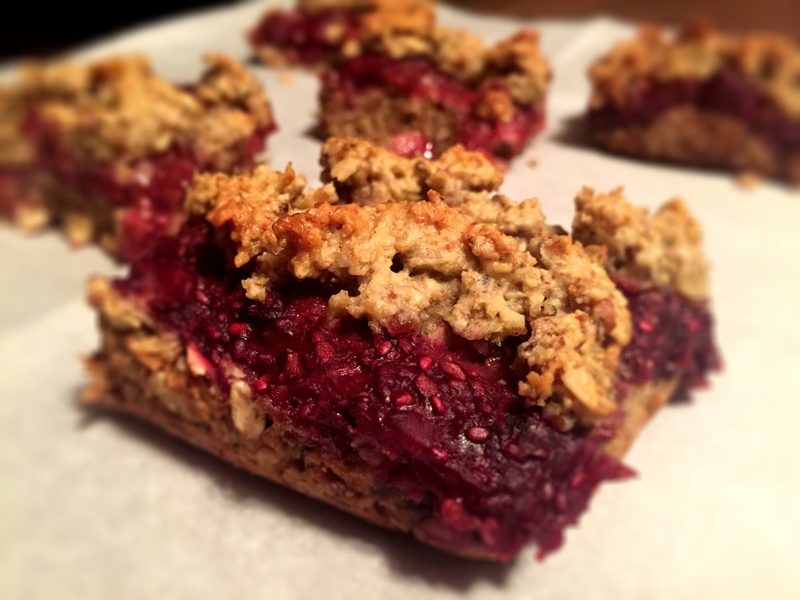 Take the remaining 1/3 of the oat dough and crumble it evenly on top of the chia jam. Bake for 25-30 minutes, uncovered, until the topping is lightly golden. Place pan directly on a cooling rack for 20-30 minutes and then carefully lift out the square and place directly onto the cooling rack until completely cooled. Slice into squares. Tip: To make oat flour, add the 1/2 cup of rolled oats into a high-speed blender and blend on high until a flour forms. You can substitute this with 1/2 cup + 1 tablespoon of oat flour if desired.